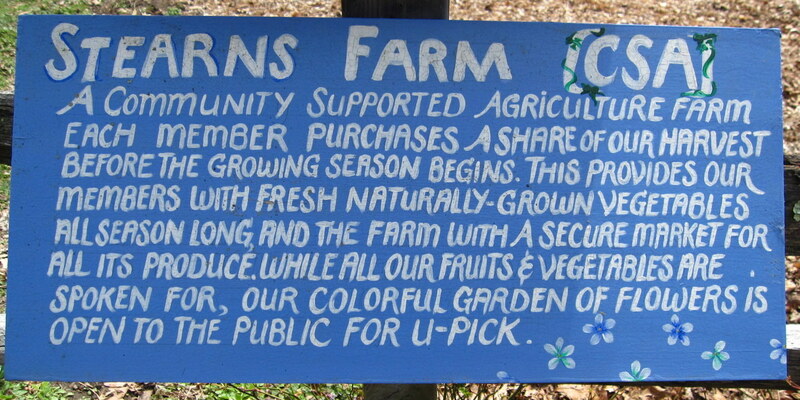 Stearns Farm CSA is a non-profit corporation funded primarily by the sale of shares in the harvest, with help from volunteers, foundations, and individual donors. Like all CSAs, it is a partnership between the farmer and the consumers in which the farmer and consumer share the risk of agriculture and the bounty of a good harvest. Consumers become shareholders by buying a “share” of the harvest. The farmer receives upfront funds for supplies, has a secure contracted market, and can therefore concentrate on vegetable farming, providing shareholders with abundant, high-quality crops. We reduce the risk of crop failure by planting over 40 vegetables and using all natural, sustainable growing methods that increase soil fertility and keep plants healthy.